Corel Digital Signage gets you going in just minutes! This post was originally written by Fernando Gonzalez and published in the official Corel Blog. It is cross-posted here with the authorization of both Fernando Gonzalez and Corel Corporation. Find out more posts from Corel Corporation on the Corel Blog. As a follow-up to my post from last week, here is another little video showing you some of the things we've been working on at Corel for the upcoming version of CorelDRAW Graphics Suite X7. Today the focus is going to be around Corel PHOTO-PAINT, and more specifically regarding the new liquid tools and the enhancements to the brush selector. Are you using CorelDRAW in interesting ways? We are always interested in learning more about how you use CorelDRAW Graphics Suite, and would like to discover some interesting ways of using our software. For example, are you designing Tattoos in CorelDRAW? If you do use CorelDRAW Graphics Suite in a "non-traditional" way, please let me know, I would love to hear from you. When it comes to supporting the different flavours of Windows, one of the key decision factor is around what CorelDRAW users have and are expected to have going forward. 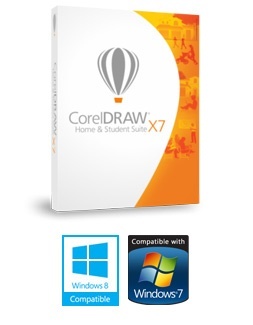 In addition, as we look at new versions of CorelDRAW Graphics Suite, we also want to make sure we provide the best possible experience to users around the world by leveraging the latest functionality provided by the operating system. As previously mentioned, you can choose how to purchase CorelDRAW Graphics Suite. You can either opt for a time-based subscription or, if you prefer, you can go with a perpetual license option (e.g. get a box or a download version). If you choose the traditional route, you can then get free Standard Membership or sign-up for a Premium Membership. Microsoft recently released version 8.1 of the Windows operating system. The latest version of CorelDRAW Graphics Suite (X6.4) has been fully tested on Windows 8.1 and works great. If you are upgrading your Windows 8 computer to 8.1, make sure to install Update 4 before upgrading to Windows 8.1, as we have included specific fixes that make for a smooth transition in our latest Update. Earlier this week we released a new version of Designs, our Windows Store App that enables you to search images online using a Windows 8 / 8.1 tablet. With over 150,000 downloads so far and a 4.5 star rating, the Designs app continues to be highlighted as one of the best app in the photo category in the Windows Store.